^ That table was discredited. 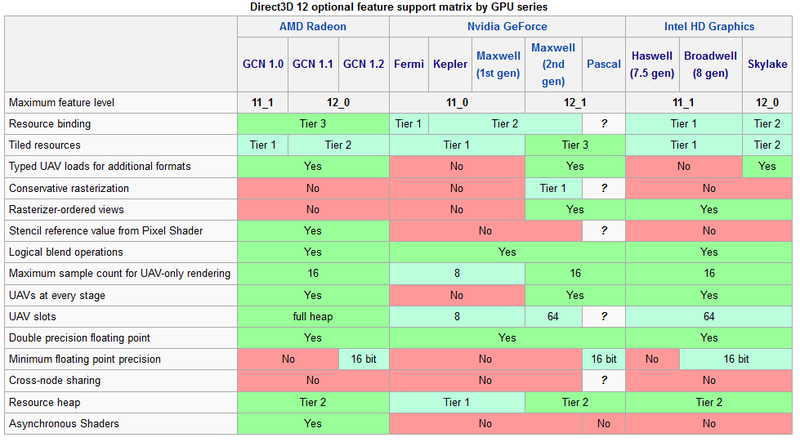 Originally from wikipedia but some idiot kept editing the table to indicate pascal has no async shader. Was eventually deleted from wiki. We must wait the new generation to have full support. What did I say in the other thread? Just ignore the junk from both sides. Sad they have to resort to petty crap. Or it's just trolls making **** up..and posting benchmarks and tables. We seen it before. Hardly original. Did someone think that current gpus would be fully dx12 capable ? I thought it is pretty clear that there are features missing here and there considering the fact that all of these gpus were pretty much made way before dx12 was done. This all pretty pathetic and just proves my point in regards to pc gamers being so hypocritical. Then theres the absolutely childish behaviour and utter delusion from a large portion of amd loyalist. The competition has been leading they way for how long now and without question, still is, constantly leaving amd to play catch up. Just one meaningless amd sponsored benchmark, the competitions lack of support for a feature that has been and still is of no real use on an api that is still meaningless until we have actual games, and you smell blood and this is how you act. Have you read what you just said in context? This whole dx12 things smacks of unsubstantiated claims and trolling then people jumping on the bandwagon thinking they can try and give credibility to what is most likely made up garbage. Wait are they trying to influence buying habits or its just petty "your gpu cant do this so there...my games are gonna get 5fps improvement over yrs". or "my hair/dust particles are gonna look amazing". Amd and nvidia is not comparable this time at ALL! Amd came out and honestly explained everything and said about their own lacking features before anyone even went looking for them. And amd isnt trying to spin their lack of a few features as an "advantage" now, or any time before. While this is inconvenient that some active fella changes it over again, he only adds stuff to it, and he is not altering originally present information. He added Async shaders, cross-node sharing, UAVs at every stage, maximum sample count for UAV-only rendering, Logical Blend Operations. Well, and he removed MS's reference. But checking what he added, they are mostly same for AMD and nV, so it does not look like he is taking sides.